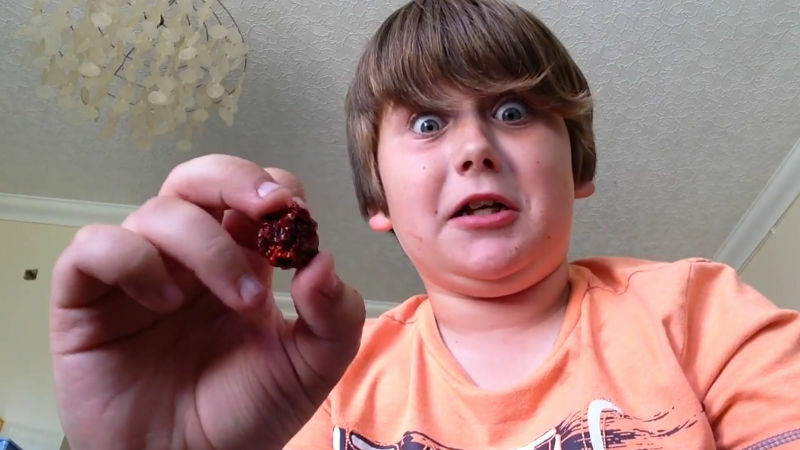 Child eats world's hottest pepper; regrets all life decisions that led up to this. Regrets: He has them all. Good news, guys: You're never too old or too young to stunt-eat a Carolina Reaper pepper and have all of your dumb life decisions flash before your eyes. Here we have a young man known as Pikachu the Pokemon on YouTube. At the beginning of the video he is filled with such hope — hope for what? Looking like a badass? Getting YouTube hits? Impressing a special girl at school who said, "Yeah, I'll go on a date with you the day you eat the world's hottest pepper"? We might never know. But quickly, that hope fades into fiery, fiery despair. This young man is only nine, so that's nine years of regrets. Does he regret buying the pepper? Joining YouTube? Learning how to read, and then reading about hot peppers? Does he regret forming a mouth in the womb instead of opting to be born mouthless? My guess is that the answer to all of these questions is YES.